Werdum is preparing to face Marcin Tybura in the main event of UFC Fight Night 121 this Saturday night (Nov. 18). Covington released a clip on Wednesday showing a confrontation with Werdum. “Chaos” later claimed that the Brazilian punched him in the face. Now Legal action is on the cards following the heated exchange between the controversial Covington and Werdum. Covington has brought his allegations against Werdum to the authorities in Australia and is seeking to press charges against the UFC Sydney heavyweight. “This guy is really audacious,” Werdum said. “I went down with my master [Rafael Cordeiro]: ‘Master, let’s get a haircut and shave the beard.’ We were in the lobby, and I’ve never seen this guy before. When I walked he looked at me and said: ‘Brazilian animals.’ And I was like: ‘Hey.’ I slapped his phone and asked, ‘What did you say?’ Then, he kicked my leg, but I managed to defend. Then the guys got in the middle and had nothing left. But he kicked me, he is audacious. I could have hurt myself. “I just got confirmation that @ColbyCovMMA is pressing charges against @FabricioWerdum. 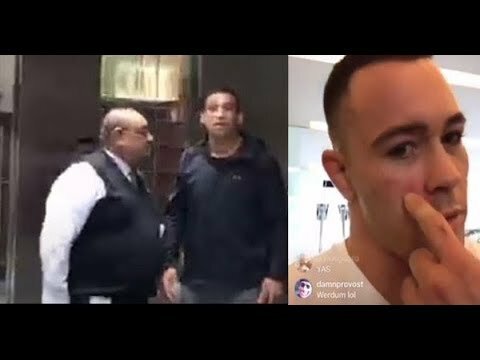 I also heard the security video shows Werdum punching Colby and the police have it. Plus there’s an eye witness that was there from start to finish. #theplotthickens #Letsseehowthisplaysout,” Sherwood stated. “The guys think you can say whatever you want, and it’s not like that. He didn’t respect Brazil his last fight. He said a lot of bad things, and it’s not good. Neither man required medical treatment following the incident,” the statement read.